One seat remaining as of Apr 20, 2019 7:57 pm PDT. Seats remaining may change at any time prior to registration and payment. This course offering is full. Please check this page for other currently available offerings, subscribe to receive email updates or contact us with your comments or questions. Explain the psychoanalytic, learning, behavioral, cognitive, humanistic, feminist, sociocultural and biological perspectives in psychology. Explain and apply the basic elements of descriptive statistics (e.g., use of graphs, measures of central tendency and variation) as well as those of inferential statistics. Explain the difference between conscious and unconscious mental processes and describe the research findings examining altered states of consciousness such as sleep and dreaming, hypnosis, and effects of psychoactive drugs. Identify the major structures of a neuron, major brain regions and subdivisions of the nervous and endocrine systems, and describe their roles in basic mental functions, such as maintaining conscious awareness, forming memories, experiencing emotions, and interpreting sensory information. Describe the major processes involved in memory with respect to encoding, storage and retrieval of information, and state the factors which have been found to facilitate or impair memory abilities. Explain the elements involved in various forms of learning, particularly observational learning, classical and operant conditioning, and their applications. Explain the role of genetics and environmental factors in influencing behaviour, traits, and abilities, with a focus on body weight and shapes, and language and intelligence acquisition. Explain the major processes involved in the ability to sense stimuli from various sensory organs (visual, auditory, olfactory, gustatory, and skin senses), and identify the basic processes involved in perception, with a focus on perception of pain. 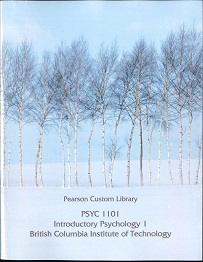 Interested in being notified about future offerings of PSYC 1101 - Introductory Psychology 1? If so, fill out the information below and we'll notify you by email when courses for each new term are displayed here.